Our saguaro friends say "hi." An early Cardinal travel trailer. First glimpse of Bartlett Lake. Pretty roads wind through the park. From high on a ridge. Cholla cactus catches the rays. The Bicycle Haus team takes a break in their 85 mile ride. Dirt roads wander through the desert. there is. We couldn't help but smile as the saguaro cactuses greeted us with arms held high. and vibrant, filled with unusual plant life, singing birds and hopping bunnies. group "Sisters on the Fly." gathering of ladies and buggies. 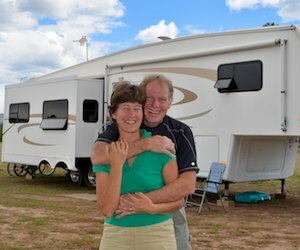 website, www.sistersonthefly.com, and thoroughly enjoyed their "Caravan Trailers"
grown to over 1000 members. What fun. Arizona all the time, but that doesn't make it any easier to witness. didn't lose its unique beauty when bulldozed. larger as you descend towards it. holding us both up by stopping to get photos. yanking their long thick thorns out of the soles of my shoes. nights here in our popup as well. the lake in the last day or two. a cat these days. None came to mind. go after that to get to the starting point like they did. leisurely photos of our dear friends, the saguaros. This entry was posted in Arizona and tagged Arizona, Arizona Central, Shutterbug, Travel, USA by Roads Less Traveled. Bookmark the permalink.